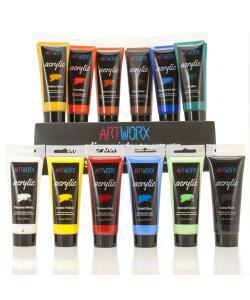 Acrylic paint set by Artworx features jumbo 75ml tubes. For all your acrylic painting needs, Artworx acrylic Studio 75 ml Paints are simply perfect! These thick consistency paints feature a high pigment count making each colour fabulously vibrant! When it comes to dimensional work nothing beats Studio High Viscosity acrylic paint, with its thick consistency, it retains brush or spatula marks.You can thin the paints for large coverage and for a range of dimensions for your artwork. Titanium White, Lemon Yellow, Yellow Ochre, Vermillion, Crimson Red, Cobalt Blue, Ultra Blue, Emerald Green, Viridian, Burnt Sienna, Raw Umber and Black.